We are delighted to introduce you to our new, delicious sweet white wine from the world’s most famous sweet white wine appellation. It’s more than just a pudding wine, we feel, as it also goes really well with cheese – and foie gras, if that’s your thing. Sauternes has to come from a designated region on the other side of the Garonne from us, so we worked with a fifth-generation grower there and bottled the wine at Bauduc earlier this year. 2011 was a terrific vintage when the celebrated ’noble rot’ took hold, shrivelling the skins of the grapes and concentrating the natural sweetness of the juice. The grapes were hand picked in three separate sweeps from 2 hectares (5 acres) of low-yielding, 60 year-old Sémillon vines that are sandwiched between the vineyards of two prestigious chateaux. The wine has already gone down well with chefs and sommeliers. 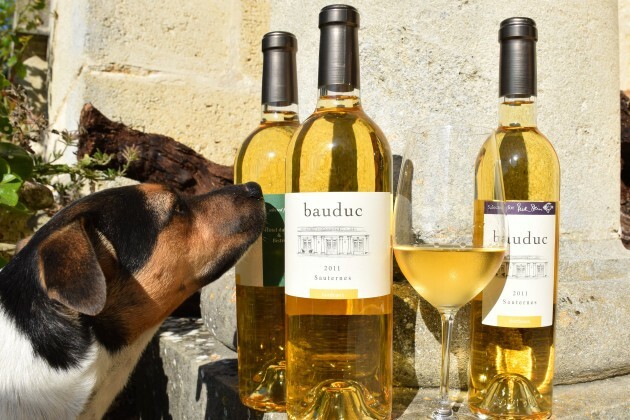 You’ll find Bauduc Sauternes 2011 at Rick Stein’s Seafood Restaurant by the glass or in 50cl bottles with Rick’s signature Bauduc label, by the glass at all fifteen Hotels du Vin (again, a bespoke HdV Bauduc label) and in 50cl bottles at Gordon Ramsays’s three Michelin star restaurant. The price is £13.50 per 50cl bottle and £19.50 per bottle.